Volume II, Number 18 Published by Students of New College, Sarasota, Florida February 11, 1966 Writer Leaves; No Reason Told Mr. Mack Thomas, New College's first writer-in-residence, has left campus and apparently will not return. The Catalyst was unable to learn why Mr. Thomas left. According to President John Elmendorf, Mr. Thomas left "after certain misunderstandings with the administration." He said Tuesday that there were angles he was not at liberty to disclose at the mo ment. Mr. Thomas left Sab.lrday afternoon with Larry Rivers, whose term as a member of the faculty of the Fine Arts Institute was due to end this week. President Elmendorf stated that he had high regard for Mr. Thomas as a writer and as a person. He added that Mr. Thomas left "with very good feelings on the students." Students Asked To Poetr y Fest Students and faculty members of New College have been invited to the third annual Florida Poetry Festival, to be held March 11 and 12 at the University of South Florida, Tampa. Students from all Florida universities, colleges, and junior colleges have been invited. The festival will feature poetry workshops and readings. In addition to readings by participating students, Robert Lowell and Robert Wallace, eminent contemporary poets and scholars, will present readings of their own works. Awards will be given at the conclusion of the festival for the best i11 e .. d. vi the five cat egories: Poets' Workshop (original poetry), Oral Interpretation of Lyric Poetry, Oral Interpretation of Narrative Poetry, Readers' Theatre, and Choral Reading. A panel of three critics will present critiques at the end of each session of oral interpretation. Mrs. Patricia Drabik, drama in structor, hopes New College students will be interested in the festival. ShEo pointed out that students are welcome as observers just as muc..h as participants. Any student interested in giving a reading at the festival will have the opportunity of preparing under Mrs. Drabik's tutelage. Those interested should contact either Mrs. Drabik or Mrs. Elizabeth Heirnert in the Humanities office as soon as possible. Top: Administration, student body, and faculty representatives sit in conference at the College Council meeting. Bottom: The SEC gathers to bear Ray Enslow give a report of his committee's findings. EC Studies Plans For More Structure At a special meeting Tuesday evening the Student Executive Committee heard recommendations for a more formal government structure. 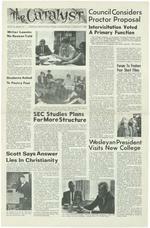 The recommendations were made by the Student Discipline Reform Committee, a sub-committee of the SEC formed to study problems in the theory and practice of student government at New College. In a lenghty report to the SEC, -th-at_a__;;cc..am_p_us_p_r_oc_t_o_r_b_e_hi_.r_e_d Ray Enslow, chairman of the Re-The members cfthe Reform Com-form Committee, listed four spe-rnittee are: Enslow, Mike Cassell, cific proposals for altering the dis-Chuck Hamilton, Paul Hansma, ciplinary and governmental system, Ted Shoemaker, and Tom Todd. (1) that a student bill of rights be Proposal #4 was expanded upon formulated; (2) that the discipli-and presented to the College Coun-nary system be revised so as to make cil on Wednesday. The Council it as specific as possible; (3)that the tabled the proposal for further con-Disciplinary Committee be sup-sideration. planted by a committee elected Basically, according to the En-directly by the student body; ( 4 ) slow report, there are two reasons Scott Says Answer for the extensive revisions called for in points 1-3. First, the committee came to the conclusion that Lies In Christianity Dr. Nathan A. Scott Jr. Professor of Theology and Literature at the Divinity School f the University of Chicago, told an audience of 150 students and guests that modern Christianity has the answers to the soulsearching of existentialist literature. Dr. Scott, a priest of the Episcopal Church and author of eleven books on the subject of religion and literature, was the first of six speakers in the third annual New Perspec tives series for students and the community. "Death," Dr. Scott stated, "is the pivotal point" of modem literary thought. Whereas man formerly believed death to be the beginning of after-life, the modern author's desacralized world view holds that existence in time is so significant as to render after-life and death itself insignificant. This is partly because "the surfaces of our lives are overpopulated with events." The Christian concept of time and eternity, however, noted in man1scitizenshipinheaven, "holds time together." In answer to a question Dr. Scott labelled the" death of God'' movement "absurd" and expressed bafflement at the murky prose of the movement's leaders. the attitude implicit in all past approaches to student discipline, i.e. that only a highly informal and structured disciplinary mechanism can deal fairly with problems of student behavior, is fallacious, and that only the introduction of a considerable degree of formality would make justice possible. Secondly, the committee has apparmtly come to the conclusion that students cannot be asked to serve as policemen among their peers. The proposed government system fContmuf'd on Council Considers Proctor Proposal lntervisitation Voted A Primary Function The College Council, in its regular meeting Wednesday, heard a proposal from the Student ExecUtive Committee that a man be hired to act as campus proctor. The Council took the proposal under consideration but did not act on it. After discussion of a separate item on the agenda, "The impact of the intervisitation rule on all aspects of the New College community, 11 the Council approved a motion by Vice-president Paul Davis that "establishment of (intervisitation) hours be considered a primary function of the College Council." The SEC proposal was presented by Ray Enslow who chairs a special Student Disciplinary Reform Com -mittee which formulated it. In a special meeting Tuesday the SEC approved, by a vote of 8-1, the committee's report for presentation to the College Council. It was stated in the meeting that defining intervisitation as a primary function does not represent a changein jurisdiction, but merely an assertion of the authority of the Council. Rules governing the Council define primary functions as involving "areas in which the responsibility for decision rests with the College Council. It is understood that all decisions of the College Council are implirnented by the chief executive officer .... The rules also term primary function "the settlement of issues involving some question of inter-community jurisdiction." No action was taken on a motion by Vice-president Davis to set intervisitation hours at 3-9 pm weekdays, 3 pm-1 am weekends, and 12-9 pm Sundays. Action was delayed by a motion made by Chuck Hamilton to allow the SEC to ascertain student opinion. Provisions of the SEC proposal are: 1) The proctor's duties "will be to patrol the campus full-time, at :ca:;t du..--ing the hours after dark, and to enforce such student regulations as he is instructed by the SEC, 2) that all violations of student regulation shall be reported by him directly and solely to the SEC (or to the DisciolinaiV Committee, or to both) which will then deal with all such according to the judicial and disciplinary pro cedures established by the SEC, 3) chat the SEC have at least an advisory voice in the hiring and dismissal of this person. Discussion which followed the presentation of the proposal ex pan-ded into general discussion of we implications of stude11t discipline and remedies for the lack or" it. Vice-president Davis said, "I don't think it should be the responsibility of students to enforce these rules at all. I think it should be a responsibility of the administration on page 2, column 5) Forum To Feature Four Short Films Tonight four film shorts will be presented atthe forum. One is the creation of Leslie Fuller, firstyear student from California. Leslie made her film in Los Angeles during the independent study period in addition to a study project on cinematography. "I did a paper for my project and made the movie for me," Leslie explained. "The other three films were made by some friends. They all run from seven to eight min utes." "My film has no title, 11 Leslie continued. "It was filmed in Grif fith Park, which is an observatory with a merry-go-round and a zoo." Leslie promised some comments on the rn eaning of the film at the forurn presentation. Leslie ana a te'Y other students have plans for making future films. "1 hope to shoot a film here some day," Leslie said. \f\ksleyan President Visits New College Dr. Victor .! :Sutterfield, President of Wesleyan University (Middletown, Conn. ) was a guest of College this week. At the invitation of President John Elmendorf and Dr. Nell Eurich, Chairman of the Educational Policy Committee of the Board of Trustees. Dr. Butterfield spent three days touring the campus and meeting the members of the college community. On Wednesday rooming Dr. BUt terfield met formally with a group of students and talked intensively with them about New College. That afternoon he was introduced to the faculty. His interest in New Colle )iCe stems from something more than pure curiosity. Although Wesleyan Uni versity is 130 years old and a basically traditional school, it has done a good deal of experimenting. According to Dr. Butterfield, there are colleges within the university employing some of the principles of this school. He believes the New College system will succeed. In noting the unrest w h i c h n o w pervades the campus, he commented: "I have found in speaking to students that there is a general tendency to talk first about what's wrong with New College. Students are often self and hyper-critical of the institution. However, upon dig ging deeper, I've jlso found that students realize how good an educ at i o n a 1 opportun1ty this place really affords. "There are assets here which are hard for students to appraise," he continued. "I think students who will stay by will realize that they got a very good education. 11 One facet of the educational process here which seemed especially to impress Dr. Butterfield is the faculty-student interaction outside the classroom. "The informal educational factor here seems very vital, he commented. Dr. Nathan A. Scott, Jr delivered the first lecture in the New Per spective Series last night. Future Perspectives lectures will be given by historian Crane Brinton and aesthetician Paul Weiss, both of Harvard University. Dr. VictorButterfield (right), Wesleyan University president, talks New College faculty members, among them Dr. Rollin Posey. A firm believer in the value of self-discipline, Dr. Butterfield also approved the administration's policy of leaving the cultivation of a student atmosphere mainly in student hands.